Info › How to? › How to transfer files using Nearby Sharing in Windows 10? How to transfer files using Nearby Sharing in Windows 10? Finally, Windows users can have the luxury of transferring files between two Windows 10 PC using nearby Share. The similar file sharing option was only available in Apple computers until Windows came up with the new update in April which supports file transfer between two Windows 10 PC. Usually external storage devices are used to transfer files between two PC’s. The chances of losing files occur due to external device corruption or due to malware infection. Though recovering lost files after cut and paste or due to any other file transfer method is possible, it is again a time-consuming process which can be avoided using Nearby Sharing. How to share files using Nearby Sharing? The file transfer will start once it is confirmed the receiving end and the duration depends on the size of the file. 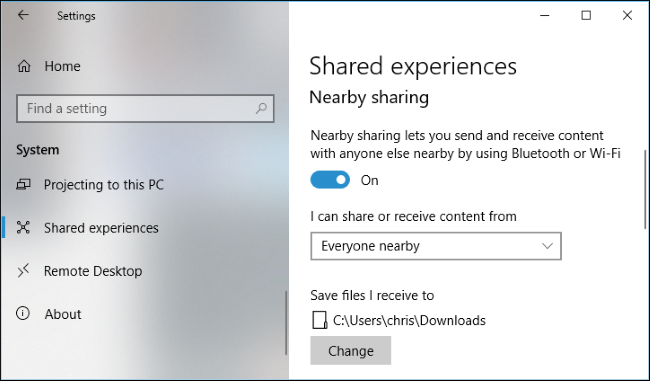 You can not only share files using Nearby Sharing in Windows 10, it also supports link sharing directly from Microsoft Edge and other files like images and videos can be shared using Nearby Sharing option. Everyone Nearby: This option will enable your PC to share or receive data from all nearby Windows 10 PC. My Devices Only: This option will allow your PC to share or receive data from your devices using Microsoft only. By default, all the files received using nearby sharing will be stored in downloads folder. You can always change the location if you want to by going to shared experiences in System Settings. One disadvantage of using Nearby Sharing is that you cannot select between Wi-Fi and Bluetooth, as Windows 10 manages the choice. This is a disadvantage because sharing data over Bluetooth can be time-consuming. Other than this the new PC sharing option is useful and helps you avoid data loss that occurs while trying transfer files using external devices. You need not worry about how to recover lost files after accidentally formatting device holding your data or losing files due to hard drive corruption. How to Transfer Files from Memory Card to Computer? How to Share iCloud Photos with Non-Apple Devices? ‹ What is Software Cracking and Software Piracy?